Twenty years ago today I was returning to high school after Christmas break for the final time. It was my senior year and while most of my classmates were stressed out about their futures, I wasn’t due to the boldest decision I’ve ever made. A decision that worried everyone around me. I had decided early on which college I wanted to attended. I had a set of criteria and found a school that met them all. So that was the only school I applied to. My guidance counselor nearly had a heart attack when she found out I was only applying to one school and didn’t have a “safety school.” I told her that it was the school that I planned to attend and I assured her I would have no trouble getting in. My parents were less concerned, but still concerned. But they all breathed a sigh of relief when I got my “You’ve been accepted to Bentley College” packet in the mail the day that winter break started. A lot of goal setting programs tell you to do just this – cut off any possible alternatives so that failure is not an option. It’s an interesting strategy because it can yield big payoffs when you’re successful. It’s also a tremendous high – there’s nothing quite like showing everyone around you that you just did what they thought was impossible. But if you’re not, it can be quite problematic. Bold goals and decisions can take a variety of forms. It could be doing something that others have tried but failed at or it could be going for the win when a tie is definite. It also depends on who you are. It’s not a big deal for a seasoned runner to attempt to complete a marathon, but it is for someone who is currently fifty pounds overweight and is planning to run the Boston Marathon in April. So why would anyone do this to begin with? In addition to the rush, it’s an effective form of motivation for those of us who have problems getting off our butts and taking action. It forces you to commit to a goal 100%. When you’ve told your family, friends, coworkers, fans or anyone that will listen that you plan on doing something, you have no choice but to deliver (or at least give 100% trying to deliver). Do bold goals work? Absolutely, but they also don’t and can potentially leave the person attempting them in a position worse off than when they started. I’ve attempted many bold goals throughout my life. Some were successful while others set me back or left me humiliated. But overall, I’ve succeeded with them more than I’ve failed. It has been quite some time since I’ve last attempted something bold which is why I decided to try something bold this year. 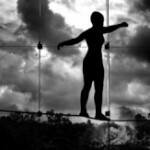 My advice for people setting bold goals is to treat it like you’re a tightrope walker. You wouldn’t start out walking across a wire that was fifty feet above the ground. You’d start lower, or at least use a safety net. So start with a bold goal that won’t derail you. Rather than professing your love to your officemate that you’ve admired for years, start out at a bar with someone you believe is out of your league. Instead of quitting your job to start a business, start it part-time during nights and weekends. Now don’t throw that big goal away. Once you’ve had that initial success and tasted victory, amp it up and try something more challenging. Work your way up for the big kill and then go for it. I can tell you from experience, that once you reach it the high you’ll get will dwarf the effects of any recreational drug out there – not that I recommend or have experience with drugs, it’s just a figure of speech. So get out there and be bold. You’ll be amazed what you can accomplish by moving outside of your comfort zone.